You amaze me. You really do. All those crazy, wonderful, beautiful projects you create out of just about anything. And if you made something special out of materials from my shop or somehow include me in your creation, then you are definitely special in my book. Barb’s Blue Willow Apron is one of those special items. 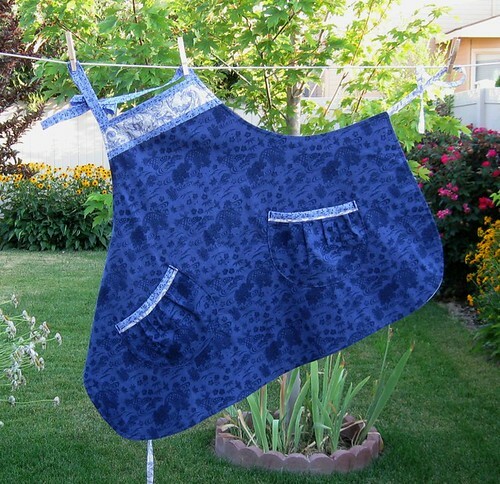 Mary Kay at Geneva Designs makes simply amazing aprons, including this custom order using one of the Kona Bay cottons in my shop. I am the sort of cook who never thinks about using an apron until I’ve ruined a silk blouse with spattered grease, so maybe one of these days I ought to get one for myself! Either that, or stop wearing nice clothes while I cook… like that’s ever going to happen. You should see what I’ve been known to wear while pulling weeds in the garden. Crazy. The sparklingly creative Marilyn utilized green floral kimono silk from my shop to produce a lovely little quilted wall hanging. My mother was particularly fond of hummingbirds, so seeing this little gem certainly made me smile. Thanks for sharing, Marilyn! This last creative effort, or perhaps labor of love, is one I stumbled onto today while checking out my Etsy stats. I noticed traffic coming from a site I’d never heard of, so imagine my surprise and joy when I clicked through and discovered morecloth.com, a sort of digital color wheel showcasing fabric sellers on Etsy. And there I was! In among the indigos I found a few of my fabrics, along with many other beautiful fabrics from the Etsy community. I’m sure with a bit more digging I’ll find more of my listings. Many thanks to the digital mastery of Catherine, the site’s creator. Brava! If you would like to share some of your creations, please let me know and I’ll include you in a future posting.